1) Core principles of Branded CEM: how we remember, choose, feel and compare. Differences between actual experience and remembered experience..
3) Replacing the Hunting Approach with Farming approach. What is “Branded Customer Experience Management” by Sampson Lee and how can you benefit from it to design and deliver an exceptional customer experience? This post summarises my key takeaways from the Global CEM* training and certification obtained earlier this year and the methodology’s elements I most valued and found applicable to any CEM change program. Satisfaction is about difference between experience and expectations. Improving the experience often has only temporary effects, because soon the customer will become used to the new experience and his expectations will rise again. This is the conventional approach where companies strive to raise the experience bar higher and higher. Because there are so many experiences that we live at any given moment, our brain can simply not remember everything. Our brain instead can only remember 2-3 moments of each experience and it will usually only remember the peak pain and the peak pleasure. If a given company focuses on too many moments, it’s wasting its limited resources because the customer cannot remember all these moments anyhow. For this reason, the unconventional approach from Lee suggests that we focus company resources only on peak and end. An experience needs to be memorable to be effective. The more focus on the pleasure-pain gap and the bigger this gap is, the more memorable the experience will be, because this will guarantee the anchoring of the experience. With regards to how we choose, the latest neurological studies show that our decisions are driven by emotions, and that only at a later moment we rationalise each decision using our rational brain and our language. How we feel during a given experience is different from how we remember and internalise said experience. Memorable experience that delivers on brand promises is stored in the Emotional Memory Region (our long term memory) and becomes the “the facto” reference company in that product category. That memory represents the “Experience Anchoring” and impacts how we compare. The primary objective of CEM is to make customers FEEL good so that they will repurchase (or stay loyal) and spread positive word of mouth (Advocacy). Reduce expectations: this is rather difficult in today’s world, because expectations are continuously raised by each company and its competitors experience delivery, and by the company communication. Expectations can undoubtedly be influenced by improving the communication towards customers to eliminate promises the company knows beforehand it cannot deliver. Objective: the one provided by the company, tangible and measurable or quantified. When we improve this experience, the benefits are often only short term, because after a while the new experience becomes the new expectation for the customer (i.e. Starbucks reducing average waiting time from 4 to 3 minutes). Subjective: the one perceived (and remembered) by the customer, intangible and irrational, emotional and memories-driven. De-branded: memorable but unpleasant; not delivering on brand promise, customer reminds them vividly and saves the experience in their emotional memory region. Creates negative Word of Mouth. Branded: memorable and pleasant, delivers on brand promise and satisfies critical needs. These experiences pass the attention gateway; they are stored in our emotional memory region, and they make the company become the de facto reference in that product category. This is where companies need to focus their resources on. No-brand: customers won’t remember them because they don’t pass our “Attention gateway” and don’t get saved in our memory. And if they do, they will not link it to the brand. When a company focuses on this one, it is wasting resources. Delivering a branded experience is the ultimate path to guarantee a higher customer satisfaction. In short: The most successful companies provide branded experiences that are saved in customers’ memory (memorable branded experiences) and become the standard for that product category. CEM is about a replacing companies’ standard “hunting” approach with a “farming” approach. “Hunting” represents the approach of most businesses to move on to the next hunt as soon as they have acquired a new customerr. “Farming” instead means nurturing the customer like you would do with a tree that just got delivered or planted. When you nurture a customer, you make sure that you get the maximum customer lifetime value and hence the business cash flow. Brand values are the values of a brand to drive customers to buy from the company (first-time purchase), to buy more from it (repeat purchase) and to refer the company (advocacy). Perceived brand values: the actual reasons or factors why customers buy from a company. Critical needs: Lee’s methodology recommends selecting seven critical needs for the identified customer segment target. You then need to score these critical needs 1 to 5 on the basis of relevancies to your company brand values. In the ideal situation, pick only three critical needs that are extremely relevant to your brand (these score 5), and focus all (or most of) your resources there, while letting all other needs score 1 as these are not not relevant to your brand, hence the focus of your efforts and investments. Because of the principle explained in point 2 (branded experience), you only need to focus resources on the needs highly linked to your values, because these are the one the customers will remember and relate to your brand. So you perform & deliver highly on needs critical to customers and your brand value, while you don’t focus and, in fact, create some pain in the needs that are highly relevant to customers but not to the brand. Touch-point: the “points of touch” where your customers experience you during their entire customer life-cycle; they usually include search engines, in-store, contact center, the web, etc. Touch-point Experience (tx): a combination of touch-point & experience. These denote a specific customer experience delivered via a particular customer facing Touch-point. For example, a pre-purchase doubt (customer experience) could be addressed by the customer via an internet search, a store visit or a call to contact center (touch-points). Each of these combinations require an emotional curve (see point 7). To save resources & focus, you only build an emotional curve for the tx which are most critical to your brand. Last but not least, what I believe is the critical starting point of Lee’s assumptions. Companies have limited resources, and therefore they need to carefully select only a few moments in the experience where to deliver WOW moments linked to the brand and hence memorable. This careful selection is done at many points in the CEXP path: selecting one or two key target customers, selecting maximum three critical needs relevant to brand values, selecting only most relevant touchpoint experiences, finally carefully selecting moments, where to deliver pain and where pleasure. These were all important learnings and reminders which I have already been incorporating in my work and methodology since I took the certification training and I will continue to use going forward. Probably because I have a different view on the last point (#8 Limited resources), I ultimately only take in a part of the methodology, rather than all of it. With this post I tried to my key learnings from an objective point of view. In the second post of this series, I express my personal take on the methodolog. The different allocation of advertising budgets towards creating and delivering a magical experience to customers which then becomes a viral hit. I’m thinking of the many such experiences provided by WestJet over and over again: WestJet Christmas Miracle is my absolute favorite (with 42 million views and a massive viral traction not only in Christmas 2013 but also in 2014!) but also the latest Frozen-themed plane has already 1 million views. These videos are a pleasure to watch because they warm-up your heart. They make you feel! They WOW you! It becomes a virtuous circle everyone benefits from! What about you? Which of these elements resonate with you? Which experience circle do you prefer to live in – both as a customer and as employee, product maker or service provider? 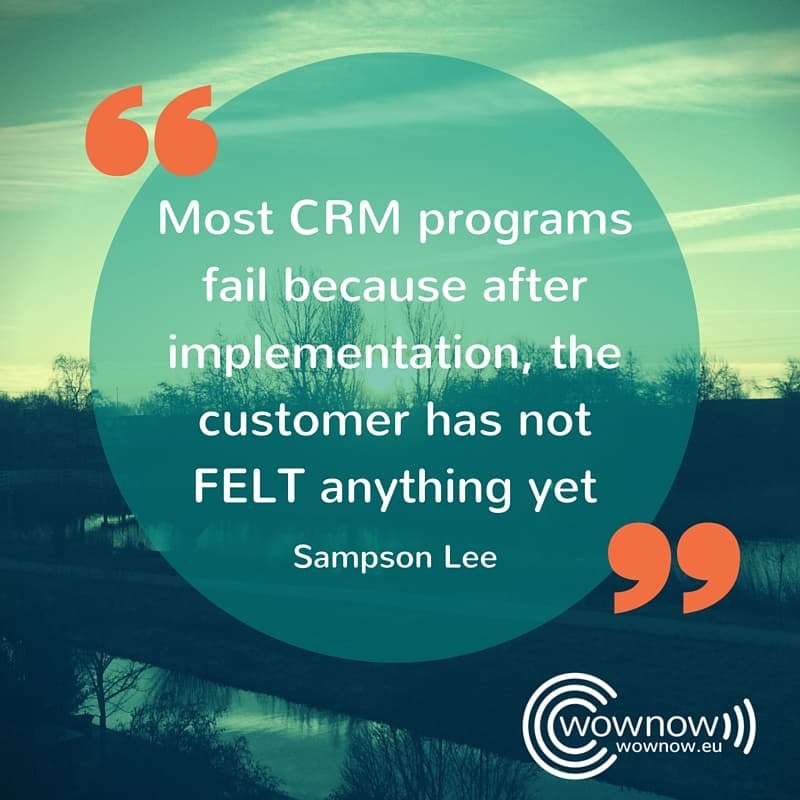 *Note: Global Customer Experience Management (CEM) Certification Program is developed based on the U.S. patent-pending Branded CEM Method and is delivered by Sampson Lee and Brownell O’Connor, with an agenda covering all of the key elements of Customer Experience Management. Copyright belongs to Global CEM. All Rights Reserved. Thank you so much for the helpful and informative article.